With its gables, towers, walls and lanes, Herrstein is the archetypal example of a medieval town on the upper Nahe river. The establishment of medieval towns was directly connected with the building of castles. During this time the ruling class (here the Earls of Sponheim) systematically built castles to safeguard their possessions and, in the defence of these castles, simultaneously laid emphasis on developing large settlements from which artisans and, most importantly, men for their armies could be recruited. The granting of a special "city charter", usually justified by means of an imperial freedom letter, made the move to the foot of a castle especially attractive. Due to their elevated legal status, these residents could be called "citizens" ("Bürger" in German), which is derived from the word "castle" ("Burg" in German). In addition, the town and castle were the seat of the court of law and the administration. The freedom of the citizens of medieval towns was, however, kept within strict bounds, for certainly the privileged position of a few patrician families and artisan guilds was in contrast to that of the majority of the townsfolk who were not "able to take council". This quite often led to social tensions. All citizens were enlisted to maintain the town wall and to defend the castle and town. Part of the town wall was a moat and city gate. Within the walls there was normally a market-place, the town hall, several public wells, and a church. There is no doubt that there were all the basic requirements for cultural achievements and prosperity through trade, markets and fairs. A special feature of medieval towns on the upper Nahe River was that many of its citizens also pursued farming in the immediate vicinity. Although Herrstein legitimately possessed all the essential requirements for a proper town, it has remained a village to this day For this reason the medieval town centre has largely been preserved. In addition, Herrstein possesses the only surviving medieval city gate on the upper Nahe River. This is because Herrstein Church, the chapel in the castle, had no steeple and because of this, at the beginning of the 19th century, the community clock, together with the bell, was hurriedly installed in the city gate. The restored battlements of the castle and three of its towers are parts of the city wall. A number of carefully restored buildings, quaint cobblestones, and the many flowers all contribute to the charm and attraction of this little town (with a city charter from the year 1428). 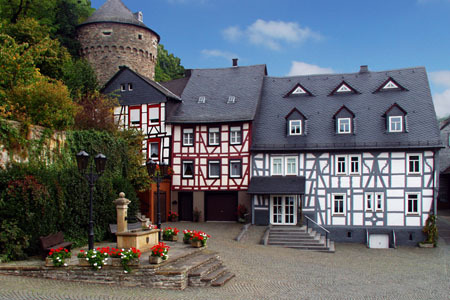 You will find half-timbered houses dating from the 16th to 18th centuries, a "clock tower" (medieval city gate), a castle with a Late Gothic chapel and a valuable Stumm organ, a massive watchtower with battlements ("Schinderhannes tower": where has the robbers" chief Schinderhannes not been detained?) and a Baroque administrative Centre. All this invites you to take a long look around and stay for a while. One small detail: in the year 1674 the citizens of Herrstein tore down their own city walls in the face of the approaching Marshall Turenne, thereby saving their town from possible destruction. As a result today's visitor still has the opportunity to have a firsthand, authentic experience of the special charm of a medieval town. There is also a local history museum where you can find information on how past generations lived. On the road through Fischbach Valley, which connects Fischbach on the Nahe River and Herrstein, there is not only the historical copper mine "Am Hosenberg," which was mentioned in a document from 1473, but also stone quarries with the most prolific mineral and gemstone finds for miles around. For many it is surely a very special experience to personally take a geode out of the earth. Before you go in search of treasure you should study the relevant brochures, for seeking gemstones in a stone quarry is not without danger. Far less dangerous are the many mineral markets there. The handicraft and farmers markets during the 2nd weekend in September and the martini market during the 1st weekend of November are also worth a visit.